Sunbury Press has released a book featuring Los Angeles-based fine artist Ione Citrin. The book is entitled "Art by Ione". It is available wherever books are sold. Oct. 28, 2010 - PRLog -- Camp Hill, PA - Sunbury Press has released a book featuring Los Angeles-based fine artist Ione Citrin. 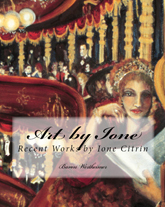 The book is entitled "Art by Ione: Recent Works by Ione Citrin". It is available wherever books are sold. Born in Omaha, Nebraska in 1938, Ione Citrin only became an artist after retiring from a successful career in show business in 1995. Since then, her award-winning second career has wowed critics and clients alike, exposing her self-taught natural talent. Ione is both prolific and diverse. She produces museum-quality works at a tireless pace, switching from mixed media to oil to watercolor to bronze sculpture. Her subjects range from abstract to figures and landscapes. Her styles vary from surreal expressionism to soft impressionism to realism. Whatever you do, do not try to pin a label on her! Abstract: The words 'fluid' and 'philosophical' come to mind when viewing these works. The artist captures the cycles of life and the universe in diverse ways. Swirls and circles emote hope, harmony and happiness. Other pieces like Atlantis capture turbulence and discord. Figures: These pieces range from timeless ancient influences that could be found in Herculaneum or a medieval castle to the modern. Ione is a master at capturing 'the feminine'. Black Tie Affair, Prima Ballerina, and Mommie Dearest could be the works of Impressionist masters. Pony Express reminds one of P Buckley Moss. The L'il Joker could be from a Renaissance deck of playing cards. Landscapes: The diversity in these works is remarkable. It is impossible to tell they are all from the same artist. Pink Sand Beach recalls Van Gogh. To Pasture reminds one of Camille Pisarro. LA Freeway could have been discovered on Picasso's easel. Others are more contemporary and just as strong in composition. Sculpture: This is not a photo guide to the National Archaeological Museum in Athens! Ione is a master bronze sculptor. Her horses are incredibly alive and proportioned. Her female figures are simply masterpieces. Antar, The Rose, Set Free, Jump for Joy and Seabiscuit could be found in any national museum of art in the world.